"saturday steal" — Pencil & Paper Co. 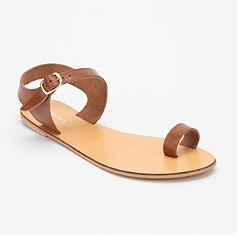 I just snapped up these great summer sandals at my local Urban Outfitters for $9.99(they put me in mind of these darling Tori Burch sandals I've been eyeing for $295)! They have tons of styles to choose from- all for this amazing bargain price! I checked on line and they are still marked $29.99- but usually they will honor the stores "sale" price!!! Happy Shopping!